The important advantage of differential operation over single ended operation is higher immunity to noise. 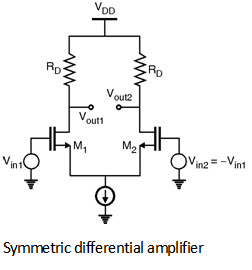 The simple differential amplifier is as shown in Figure below. The other advantage of differential amplifier is the increase in voltage swings. The peak to peak swing differential amplifier is equal to 2 [V DD - (VGS - VTH)]. In the circuit of above Figure if Vin1 and Vin2 has a large common mode disturbances or unequal common mode dc level then the output response has distortions. As Vin, cm changes, bias currents of M1 and M2 also changes. Thus the transconductance of both the devices and output common mode dc level changes. The variation of the transconductance in turns leads to change in the small signal gain of the amplifier. In order to solve the problem of common mode dc level the circuit shown in above figure is modified by employing a current source ISS to make (ID1 + ID2) independent of Vin, cm. 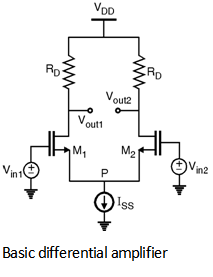 The modified circuit incorporating current source ISS is as shown in Figure below. Thus, if Vin1 = Vin2 the biasing current of each transistor equals and the output common mode level is VDD - . The input-output characteristics differential pair is as shown in Figure below. Now, according to saturation current equation of MOSFET. Take square on both sides. Thus, if Vin1 = Vin2 then ID1 - ID2 falls to zero, and increases from zero if | Vin1 - Vin2 | increases. For a fully symmetric differential pair which senses inputs by equal and opposite amounts then the concept of half circuit can be applied to find the gain of the differential amplifier. 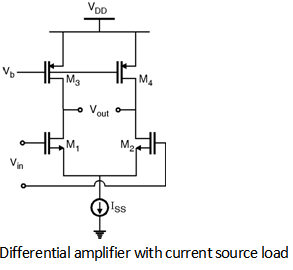 In order to increase the gain of the amplifier the load resistance can be replaced by the current source load as shown in Figure below.